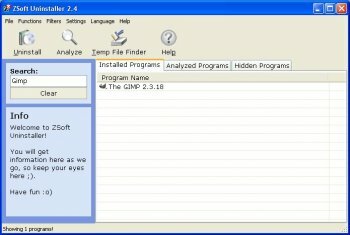 ZSoft Uninstaller is an easy way to uninstall programs on your computer. Location and uninstalling a program with this program is as easy as clicking a button. It also, among other things allows you to analyse an installation so it can be completely uninstalled and find and delete temporary files. This was my favourite tool (in general, not just as an uninstaller) on XP. Too bad it doesn't support 64-bit and development has been slow to non-existent since v2.5. There aren't any free alternatives that has the simple, non-bloated, portable features of Zsoft Uninstaller. There are others like Revo Uninstaller Pro (free version doesn't include monitoring function) and Advanced Uninstaller, but they appear to come with bells and whistles and no portable version available. Also, they only capture file & registry system changes related specifically to the installer you're monitoring. The drawback to this is that there may be other (unintentional or not) changes during installation that these tools don't capture. If anyone knows of alternative I'd love know. Even is not the fast one it's still the best one! You can be sure that all the garbage is removed if you analyze an installation. Great job by ZSoft! Works well and is easy to use. Love that you can just right-click on installation file and select "monitor". Only issue I've noticed is that lately it's taking awhile to read the registry - now that I have so many programs installed. Still - best I've tried. Nice.It found programs cp couldn't and gave great detail for all of them.I am impressed.It is fast and light. This would be interesting if you added this into reactos..or remove the cp add/rem when making a custom made win cd with nlite etc. Doesn't work for me. It hangs when analyzing. I have been using this program since it's conception. It loads much faster than the "Add or Remove Programs" through WinXP's Control Panel. Has a "record" option that monitors a program's installation. never thought, that the program, i'm using long time got an update ... this uninstaller is faster, better and more useful than ms own ... great! Quote: Very useful program. But one "issue" - when I uninstalled "digital tv... something" at the end asked me if I want to delete "c:\windows" because the program ("digital...") was installed there. Witch was not true either. Scary. I personally have never had a problem w/ it and it's one of those 'must have' applications when installing a new machine.. Very useful program. But one "issue" - when I uninstalled "digital tv... something" at the end asked me if I want to delete "c:\windows" because the program ("digital...") was installed there. Witch was not true either. Scary. Good and a lot faster then the builtin one. Just one note, please let the user chose WHERE he wants to put the start menu entry. Not everyone wants to have a 3 column menu, some people like to organize and use subfolders. I have been very impressed with this utility. I use it to monitor every software installation. I definately recommend using it over the Add/Remove Control Panel. It is much faster and offers detailed information that you can't obtain from the CP. Much faster than windows add/remove programs. The Windows Add/Remove takes a long time to load in WinXP. Pretty good program from what I can see so far. I've always used Add/Remove Plus! 2004 & 2005, but this one doesn't seem to be a resource hog like the other.. I'm pretty impressed with it so far.